Shirley Lucas Jauregui dreamed of owning and riding a horse while growing up on the edge of Bartlesville, Oklahoma. Jauregui and her sister, Sharon, landed their first trick riding appearance at the 1948 Lakeside Rodeo followed by the Sheriff’s Rodeo at the Los Angeles Coliseum. The sister act juggled their nationally-known act, performing at the National Western Stock Show in Denver, the Cow Palace, and Albuquerque, with movie contract work, doubling for movie industry names such as Marilyn Monroe, Audrey Hepburn, Shirley Jones, Betty Hutton, Grace Kelly, just to name a few. They also had their hand in designing the latest western fashions for women by working with brands such as Wrangler. 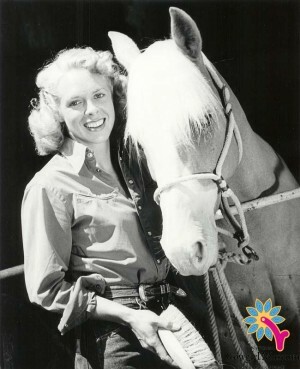 Jauregui was named California’s Cattlewoman of the Year in 1996, and received the Tad Lucas Memorial Award from the National Cowboy and Western Heritage Museum in 2008.